Cosmology ... The creation of MASS. 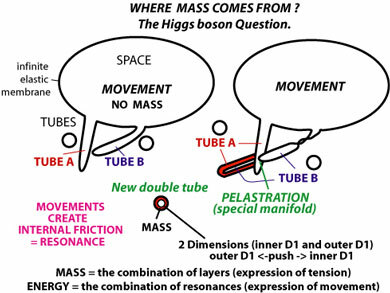 WHERE MASS COMES FROM ? The main problem in Cosmology is: where does MASS comes from, at the most fundamental level? To find that answer physicists try to find via large accelerators the Higgs boson which should be a spin-zero particle with nonzero mass. The central point of our approach is that MASS is created by a very special non-ecludian manifold. We call that manifold: a pelastration. By movements of a space - which has an infinite elastic membrane - parts of that space can be doubled, ... that way creating - locally - a new dimension (or layer) of a part of that same space. It's at first sight a paradox, but it is in fact adding a kind of 'isolated' part. The incident manifold location acts like a type of pressure valve, a wormhole. A new double layered tube is created with other internal conditions (tension, space curvature, horizon, density, ....), and general and specific local movements create friction between the layers ... creating resonance and all other interactions (EM, strong and weak forces). Essential is the possibility to couple parts of the Mama-Brane. This goes by complete penetrations (several types), called pelastrations. This new type of Branification approach explains the essential boundaries to understand 'gauge' levels of spin. What we call Spin is thus caused by orientation or layer-history. The essence of string theory: 'The subatomic particles we see in nature are nothing more than different resonances of the vibrating superstrings' is also respected in this approach. Resonances are however mechanical string-contacts, and not 'magic' fiels. Different combinations of these manifolds and combinations with other types of connections create the basic particles of our Universe, thus: leptons, quarks and mediators (bosons). 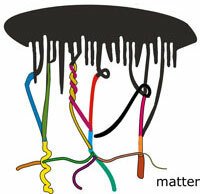 The black area (below) is only a section of the membrane. The combinations of these basic particles create the more dense levels of matter as we know them. Each time a connection is made with another tube the qualities or appearance changes. Since the original space (Void) is surrounded by an unbreakable almost infinite elastic membrane each particle is in fact connected with each other by the membrane which becomes thus gravity. [You can compare this with the blood-vessel system in our body: there is only one wand (blood cells can flow anywhere inside)]. The small tubes have internal shifting layer movements which provoke specific vibrations in the total microtube, that way creating resonance with other similar microtubes in the neighborhood or through the common membrane. Such interactions create the weak, electromagnetic and strong forces. A microtube can be called a quantum package, a wave, a particle, a string ...depending from the observers point of view ... but the tube concept adds the common membrane which acts as the graviton field. 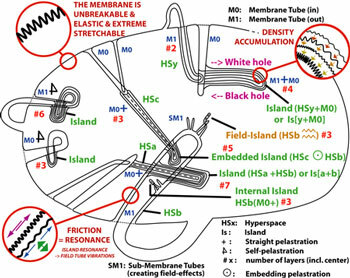 Only with one starting 'membrane tube' everything can be explained. This approach can although also be applied on a torus which gives a more complex approach. The general Principles of Pelastration are presented in the image on the left. This approach has the advantage that each 'isolated unity' keeps still it's historical INTEGRITY. -> de-couple (Black hole separation A and B) -> re-couple (New white hole A+X) and/or (new white hole B+Y). This kinetic mechanism or process shows the concept of the Gravitational Ether where Einstein was searching after for more than 30 years. 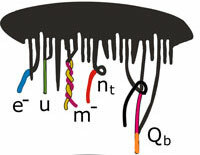 This approach can be compared with the original "Riemann Space" (a crumpled piece of paper) which contained many different hidden layers, and where a bookworm was travelling through the paper. What we add here is that the spots on the paper can be re-structured in various type of enfolded origami, which we call in our theory: holons. Since the crumpled ball (space-time) is dynamic also all enfolded elements on it's surface - being part of it - will move too. And also their hidden layers are kinetically acting on each other. This is a Occam Razor applied; we don't need Quantum superpositions. 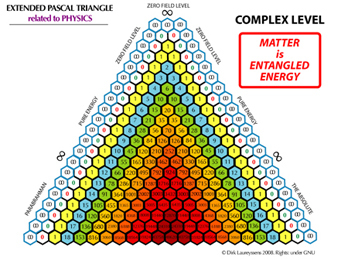 We can look to "matter" as being "entangled energy". Where the dynamic property of prime energy (a neutral zero-field, a membrane) is translated or converted in 3D-spaces (3 layers) , which can couple in more complex shapes (or containers) to fundamental particles, which can combine to atoms and molecules. This dynamic process of progressive layering can be presented by an extended Pascal Triangle, where the "energy" is more and more "frozen' into high dense (mass) combinations. More. The approach of enfolding(s) of a non-breakable membrane explains how pure energy is locally converted into multi-layered spaces (holons), where these holons can/will make combinations with other holons or with the membrane. The animated image on the right shows how two local parts of a single dynamic membrane can pelastrate to a very complex system which has more and more local layers. But all layers are still sub-parts of the single membrane. That explains the universal interconnectedness and the continuous elastic inter-relationship (gravity, attraction). The more layers a local system has, the more mass it has. And of course the more layers a holon has, the less flexibility (hard) a complex system becomes. This approach is similar as the morphogenetic enveloping we see in biology, where this is called "invaginations". The image shows for example a womb-like space below that is side-wide connected with an upgoing channel. That explains the re-cycling principle in nature. The image gives a theoretical perfect harmonic system, but in reality the universe will also have a lot of inharmonic combinations. The image on the right shows the essential difference with the actual String Theory. © Dirk Laureyssens, 2002-2009. All rights reserved.